SPSS one-sample chi-square test is used to test whether a single categorical variable follows a hypothesized population distribution. A marketeer believes that 4 smartphone brands are equally attractive. He asks 43 people which brand they prefer, resulting in brands.sav. If the brands are really equally attractive, each brand should be chosen by roughly the same number of respondents. In other words, the expected frequencies under the null hypothesis are (43 cases / 4 brands =) 10.75 cases for each brand. The more the observed frequencies differ from these expected frequencies, the less likely it is that the brands really are equally attractive. Before running any statistical tests, we always want to have an idea what our data basically look like. 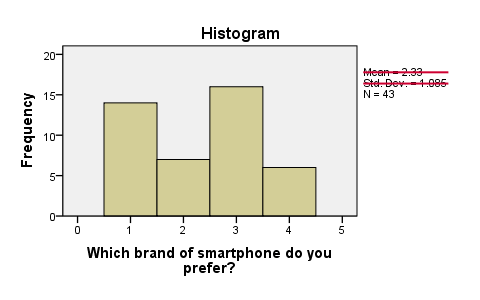 In this case we'll inspect a histogram of the preferred brand by running FREQUENCIES. We'll open the data file and create our histogram by running the syntax below. Since it's very simple, we won't bother about clicking through the menu here. cd 'd:/downloaded'. /*Or wherever data file is located. First, N = 43 means that the histogram is based on 43 cases. Since this is our sample size, we conclude that no missing values are present. SPSS also calculates a mean and standard deviation but these are not meaningful for nominal variables so we'll just ignore them. Second, the preferred brands have rather unequal frequencies, casting some doubt upon the null hypothesis of those being equal in the population. The first assumption is beyond the scope of this tutorial. We'll presume it's been met by our data. Whether the assumption 2 holds is reported by SPSS whenever we run a one-sample chi-square test. However, we already saw that all expected frequencies are 10.75 for our data. Expected Values refers to the expected frequencies, the aforementioned 10.75 cases for each brand. We could enter these values but selecting All categories equal is a faster option and yields identical results. *3. Chi square test (pasted from Analyze - Nonparametric Tests - Legacy Dialogs - Chi-square). under Expected N we find the theoretically expected frequencies;They're shown as 10.8 instead of 10.75 due to rounding. All reported decimals can be seen by double-clicking the value. Asymp. Sig. refers to the p value and is .073 in this case. If the brands are exactly equally attractive in the population, there's a 7.3% chance of finding our observed frequencies or a larger deviation from the null hypothesis. We usually reject the null hypothesis if p < .05. Since this is not the case, we conclude that the brands are equally attractive in the population. Your question basically refers to a post hoc test for the chi-square independence test. The omnibus test tells us that not all population proportions are equal. But which one(s) is statistically significantly different from which? Well, if the assumptions for this test have been properly met, the adjusted standardized residuals roughly follow a standard normal distribution so values > 2 or so suggest that a cell's frequency is larger than may be expected from mere sampling fluctuation. You can add ARESID to the CELLS subcommand in order to inspect them.